Advantages: A readable account 21 Army Group's assault on the Rhine; interesting photos, colour plates and maps. I am not associated with the Dutch Cavaleriemuseum below in any way, but I thought that I would bring the book to the attention of ‘Missing Lynx’ readers as it is the sort of publication that might otherwise slip under the radar. 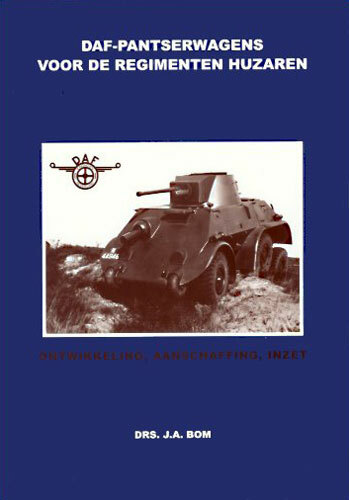 This new book describes the development and use of the Dutch DAF M.39 armoured car. DAF built the M.39 in small numbers for the Dutch Army immediately before WW2. Only 12 were made, and not all of these were finished by May 1940. If I have understood the text correctly, only one vehicle saw action with Dutch forces in 1940, although the Wehrmacht took over a number and they served thereafter in Russia. The book is a very complete historical reference volume that seeks to describe all aspects of the DAF M.39 – this means that it includes information that isn’t necessarily of direct value to the AFV modeller, including photos of the factory, personalities and organisational charts. It is an equal mix of text (Dutch only) & illustrations. That said, there is a great deal of useful information for anyone wishing to model the M.39, including detailed drawings and many clear B&W photos. A softbound A4 volume, it has 168 pages and many illustrations (I didn’t count them all). The development of modern armoured cars for the Dutch cavalry. Operational service of the M.39 - in the 1940 campaign (including the action of car III-2203 in the counter-attack at Overschie) and with the Wehrmacht. Photo coverage is very good – it includes a few rare shots of the M.39 in Dutch service before the 1940 campaign, other photos of vehicles destroyed by Dutch forces before the surrender and still more in German service. The latter include some exceptionally clear detail shots. The drawings make the armour layout clearer for the modeller.